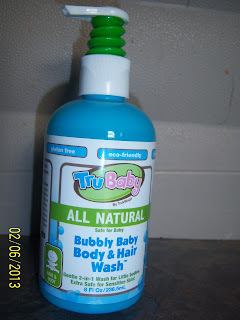 TruKid Baby Body and Hair Wash is all natural, eco friendly, gluten free and of course biodegradable. I used on all my kids and they loved it. It did not burn their eyes like so many other shampoos do. TruKid Baby Body and Hair Wash lathered really well, making their hair soft and thick. TruKid Baby Body and Hair Wash smells like pink grapefruit which is great compared to the normal baby soft smell. It was nice to have both baby wash and shampoo in one bottle it made it easy and faster to get kids in and out of the bath. My daughter Sarah loved to play with the bubbles that the TruKid Baby Body and Hair Wash made, it was an extra bonus for her. TruKids also has a bunch of other products to choose from like Lotion and Hero Stick which I reviewed here , skin care from the sun, and bath care. All products you use everyday when you have children so why not try something new and Tru. You can swing by their facebook page and like them by clicking this link, once you like them head over to their site and if you make a purchase of $30 or more you can use code bubblymom and get a FREE Bubbly Body Wash! Disclosure: I was given TruKids Shampoo to help with my review. All opinions are 100% mine.